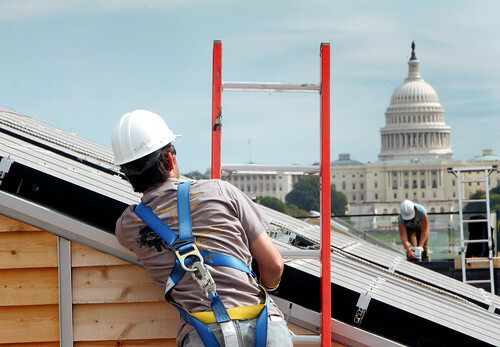 The 2009 Solar Decathlon competition is underway in Washington, DC. Twenty teams from around the world, including Iowa Sate University, arrived last week to reassemble their solar houses along Decathlete Way on the National Mall. Public tours began yesterday and continue through next Sunday, October 18. All twenty solar houses will be closed to the public on Wednesday for judging and measurement purposes. It has been interesting and exciting to watch the project progress from design to construction here at Iowa State. So far the Interlock House has been doing pretty well in the score standings, which are judged on ten categories and continuously updated throughout the week. I was in Ames this past weekend where my friend Eric Berkson, IT Coordinator for the Iowa State Solar Decathlon team, gave me a tour of their solar powered house under construction. Called the Interlock House, it utilizes a NanaWall system on the south facade to create a versatile sunspace that can be closed as a solar-collecting greenhouse in winter, a recessed exterior porch for summer, or completely open for cross-ventilation. It is a very cool system. The 2009 Solar Decathlon competition will be held October 9 – 18, on the National Mall in Washington, DC, where the Interlock House and 19 other competing solar houses will be reconstructed and open to the public. The Interlock House website includes an interesting photo blog, which I borrowed the following photo from. CyRide has now published online the timetables for Moonlight Express Alpha (A) Shuttle. Previously the protocol for the late night weekend bus service, would be to call in to base for location and time of the fixed routes A – D. However, not everyone needing the bus on Friday and Saturday nights are drunk and are able to look up the bus schedule themselves. The schedule is only published until about 2am, even though service runs closer to 3am – this allows CyRide to adjust the schedule and service level as needed. Timetables for Bravo (B) and Delta (D) shuttles, both serving Frederiksen Court, and Charlie (C Shuttle), serving Towers and Billy Sunday, remain unavailable to the public. Bravo and Delta alternate service to Frederiksen, providing continual 18 minute headways between Freddy and Campustown throughout the night. 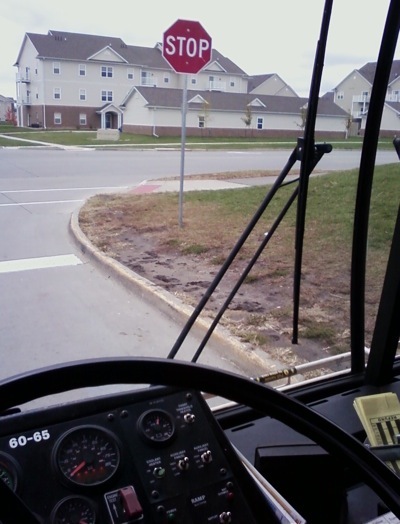 First campus-bound bus departs Freddy at 10:34pm, and then every 18 minutes after until end of service.